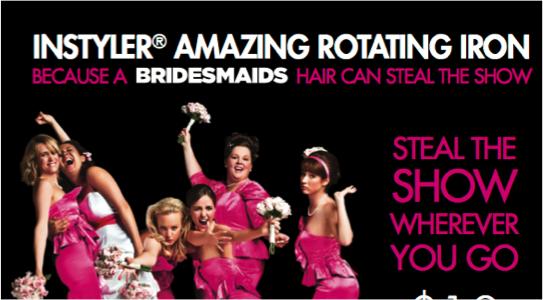 The InStyler hair styling tool executed a national promotion with the DVD release of Bridesmaids. Created a “Great Bridesmaid Looks You Can Do Yourself” special feature on BD-Live featuring an InStyler instructional video. Featured Bridesmaids in InStyler and TopStyler infomercials. Hosted a sweepstakes to win a trip for you and five friends to Los Angeles with a complete InStyler hair makeover and a visit to Universal Studios. Supported with print and social media.